According to Tesla, the Model 3 Standard Plus has sold at more than six times the rate of the Standard version. Because of this lack of demand, the Model 3 Standard will now be a "software-limited version of the Standard Plus” to streamline the range and cut down production costs. You also won’t be able to order it online anymore. Instead, you can now only buy the Model 3 Standard by calling Tesla or visiting a dealership. Compared to the Standard Plus model that has a 240-mile range, its range will be limited by ten percent. Several features will also be disabled by software including Tesla’s onboard music streaming service, navigation with live traffic visualization, and heated seats. You’ll still be able to upgrade to the Standard Plus model, however. Likewise, Standard Plus owners will be able to downgrade to Standard and will receive a refund for the difference in cost. Deliveries of the Model 3 Standard will begin this weekend, Tesla says, but they were originally supposed to start by the end of last month. Pricing for the Tesla Model 3 Standard Plus is also increasing. While it used to cost $37,500, it will now set you back $39,500, an increase of $2,000. You now get Autopilot included as standard, though. This would have cost an extra $3,000 before, so you're saving $1,000 if you wanted Autopilot. 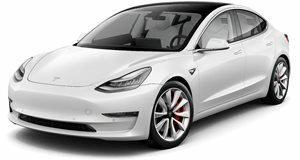 US customers will now also be able to lease the Model 3 for a "small down payment and competitive monthly payments.” Customers can choose any Model 3 variant and select an annual mileage option of 10,000, 12,000, or 15,000 miles. You won’t be able to buy the car at the end of the lease, however, as Tesla plans to use these vehicles in its future ride-hailing network.